Lavender essential oil uses in your daily life. Lavender is the most versatile essential oil around. With a spread of properties ranging from analgesic, via antidepressant, antiseptic, bactericidal and decongestant, to insect repellent and sedative. It is calming, soothing and balancing. Perhaps the most important property of Lavender oil is its ability to restore unbalanced states – whether of mind or body – to that state of balance in which healing can take place. Lavandula angustifolia means ‘true lavender’. It is associated with lavender water, the bags to perfume clothes and linen, and keeps moths at bay. It is also the best loved and most used oil in the whole of aromatherapy. One of the lavender oil uses Dr Jean Valnet saw was to treat serious burns and war injuries when he was a French army surgeon. As lavender is both antiseptic and analgesic, it makes it an ideal choice for treating burns and all kinds of injuries. Lavender oil also promotes rapid healing and helps to prevent scarring. Because of the analgesic, antiseptic and antibiotic properties of other Lavender oil uses also include treatment of colds, coughs, catarrh and sinusitis, as well as flu, the most effective form of treatment being a steam inhalation. It can sooth, de-congest, and attack the bacteria. Lavender essential oil uses are also discussed here. Lavender is also an effective sedative, so such an inhalation, just before going to bed, will aid sleep, and this is in itself helps recovery. A few drops of Lavender essential oil (neat) can be massaged onto the throat to relieve a tickly cough. A drop or two can be massaged along the bony ridges of the eyebrows and on either side of the nostrils; in doing this, you will be working on some important acupressure points for catarrh, as well as using the decongestant and antibacterial action of Lavender. Massaged into the temples, Lavender will relieve many forms of headache. If this alone does not help, a cold compress of lavender can be placed on the forehead or back of the neck. To relieve muscular pain Lavender essential oil uses in a massage oil, either alone or blended with another oil, such as Marjoram, Rosemary. 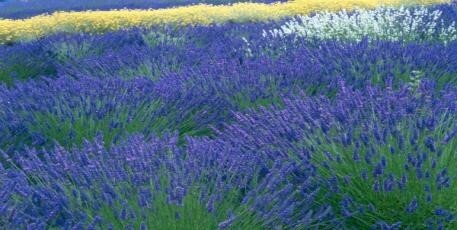 As lavender heightens the action of any oil with which it is mixed. An aromatic bath with Lavender will also give relief to muscular pain. As Lavender oil may reduce pain locally, it can be used to relieve pain of rheumatism, arthritis, lowering the reaction to pain of the central nervous system, reducing inflammation and toning the system generally. Lavender oil is helps reducing menstrual pain, either massaged gently into the lower abdomen, or made into a hot compress. Lavender oil can help with many of the minor upsets of infancy, too – colic, irritability and childhood infections, the lavender essential oil should be very well diluted. A single drop of Lavender oil in a baby’s bath will help an infant to sleep. Dilute the oil first in a little almond oil, as essential oil and water do not mix. . One or two drops on pyjamas will often soothe a sleepless child. The action of Lavender on the muscle of the heart is both tonic and sedative, making it valuable for the treatment of palpitations, and it also helps to reduce high blood-pressure. Massage and aromatic baths (not too hot) are the most suitable mode of use. 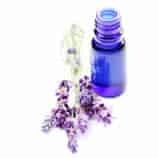 Lavender essential oil uses in skin care. The soothing, antiseptic and anti-inflammatory properties of lavender pure essential oil make it valuable for many skin-conditions, and its delicate and well-loved aroma lends itself well to blending in creams, tonics, in concentrations of 1% to 2%. Lavender is one of the most valuable oils for the treatment of acne. It inhibits the bacteria, which cause the skin infection, while soothing the skin, helping to balance the over-secretion of sebum, which the bacteria thrive on, and helping to reduce scarring. Lavender is one of the three essential oils which most powerfully stimulate the growth of healthy new cells – Neroli essential oil and tea tree essential oil are the others, although all essential oils share this property to some extent. Lavender oil blended with grapefruit and eucalyptus essential oil applied to the skin will help you avoid being bitten by mosquitoes and other insects, but if you get bitten or stung, a little of the neat oil, applied as soon as possible to the skin, will take the pain out of the sting and help to stop the irritation spreading and infection entering at the puncture point. Because of its balancing nature, lavender oil is of great value in helping people who are in an unbalanced emotional state – hysteria, manic depression or widely fluctuating moods. Massage of either side of the spine with lavender oil can help profoundly in such situations. Baths as lavender essential oil uses are also very useful as a very valuable and effective form of self-help. Insomnia is one of the states for which Lavender is the supreme choice of essential oil, whether the causes are physical discomfort or mental stress, anxiety or an over active-brain at night. A few drops of oil on a pillow case will be almost as effective as taking a bath. The great variety of lavender essential oil uses is related to the chemically complex structure of the oil and its numerous active constituents.